I met M.P Barker last summer, when she and I sat on the J/YA panel at the Historical Novel Society Conference. I knew right away that we spoke the same language. 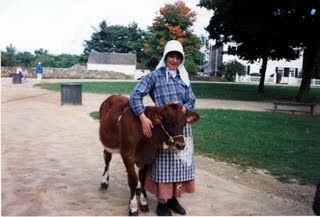 M. P. got a firsthand taste (sometimes literally) of nineteenth-century New England rural life when she worked as an interpreter at Old Sturbridge Village (OSV), Massachusetts. There she milked cows, mucked out barns, and found inspiration for her historical novel, A Difficult Boy (Holiday House, 2008). When she left OSV, she became an archivist at the Connecticut Valley Historical Museum, which provided more fodder for her fiction. 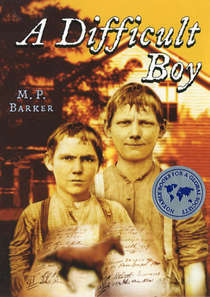 A Difficult Boy is set in 1839. Nine-year-old Ethan does not want to be an indentured servant, but his family has no other way to pay off their debts. Q: Were you writing, or thinking of writing, historical fiction while working as an interpreter? Or did that come later? Interpreters’ days aren’t filled only with chores! I started playing around with fiction again when I was in my 30s, not thinking I’d ever get published, but mostly to entertain myself. And when I started, I was terrified of writing historical fiction BECAUSE of working at OSV! The more I learned there, the more I realized I could get wrong. And I’d have no end of merciless mockery from my co-workers for it! But then the idea for A Difficult Boy came to me, and the characters insisted that I get over it and tell their story. Q: You mention that an archival document sparked the idea for A Difficult Boy. What was that? A: The document was an 18th-century bill sent to the parents of an indentured boy from the boy’s master after the boy had run away. The master apparently chased the kid down and brought him back, then billed the parents for his expenses—use of a horse, overnight stays in a tavern while chasing the kid, court costs, and so on. And to top it off, he billed them for the value of seven months’ lost labor for the time the boy was missing. The bill was about $1500-1600 in today’s money. It made me wonder why the boy ran away, what the relationship was between the master and servant, and how the parents were going to pay the bill. At the time, I was in a writing group, and I decided to use the master and servant in one of the writing exercises that we were asked to do. 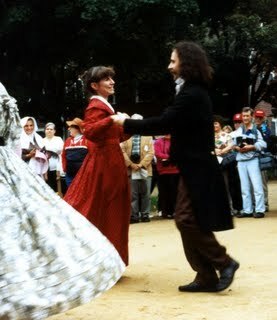 I moved them into the 1830s, because I knew that era better than the 1770s. I kept returning to those characters, and pretty soon others developed, and a bunch of random scenes and character sketches eventually evolved into a story. Q: I appreciated how skillfully you wove in some ideas that were perhaps secondary to the plot trajectory, but so true to the period. For example, reading A Difficult Boy made me think about how hard life would have been for a person with dyslexia, or a person with severe vision problems. Did you have any particular inspiration for including those things? A: Thanks, Kathleen! On the surface, I needed to have the villain bamboozle a couple of characters, so giving them dyslexia or poor eyesight was a convenient way of doing that! But it wasn’t just a convenient plot device; I think that giving these characters two fairly commonplace problems that we consider fairly manageable today really makes the contrast between past and present more immediate and personal to readers. I also wanted readers to grasp the idea that 19th-century people aren’t just like 20th or 21st-century people wearing funny clothes and doing without electricity. They actually thought differently from modern Americans. I’m always fascinated by—and thankful for—how our perception of people with mental and physical challenges has changed by leaps and bounds since the 1830s. And those changes are perhaps even more significant than the technological changes. 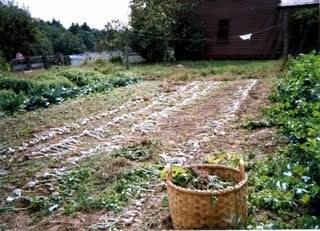 Q: I’m guessing that the excellent descriptions of agricultural life emerged from your memories of your time at OSV. Are there other aspects of the book that you can trace to your interpretive years? A: Lots! There’s Nell. (For those who haven’t read the book yet, Nell is a particularly obnoxious cow). She’s the only character in the book who’s based on a real, um, being. We had this brindle cow at OSV who would kick or hook you as soon as look at you, and gave you a devil of a time to milk. So I put her in the story. Everyone who worked on the Freeman Farm immediately recognizes her when they read the book! 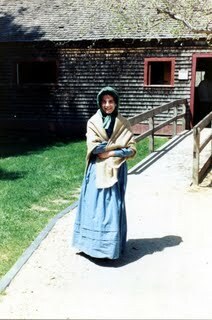 While at OSV I did research on peddlers in New England to provide information for interpreters who would role-play as storytelling peddlers. Some of that research went into the character of Mr. Stocking. Also, the lines from the songs that Mr. Stocking sings during the horse race are altered versions of tunes I learned in the OSV Singing School. In one scene, Ethan teaches Daniel to play some games, like ninepins (bowling) and shuttlecock (badminton). Ethan doesn’t have any proper game pieces, though, so he makes his ninepins by standing kindling wood on end, and he whittles down a beet to make a bowling ball. Ninepins and shuttlecock were among the games that were demonstrated at OSV—with proper 19th-century equipment, of course. I think the beet-and-kindling-wood version was inspired by a similar game of ninepins that a couple of friends of mine played in the barn, except that instead of a beet they used a particularly stony loaf of bread for their bowling ball. Q: Your figurative language is beautifully anchored in the time period. (Ex., “Lizzie’s stained and faded brown flannel dress was the color of an overdone Indian pudding.) Did you work particularly on those details at some point in the writing process, or did you find them presenting themselves in the flow of writing? they talked, their gestures, etc., and I’d add those details in later. A: I’m working on a sequel to A Difficult Boy in which Daniel joins up with Mr. Stocking, the peddler, and they join a traveling show. Complications ensue involving a runaway child, an East Indian mystic and conjurer, Irish railroad workers, six dancing ponies, and a rope dancer. I’m having a much harder time with this second book because the story and settings are more complex than in the first one. I keep saying “I’ll have it done in three months,” and then the three months go by and I’m still nowhere near finished. I’m nearly finished with a second draft, but it’s still very VERY rough, and I need to go back and do LOTS of rewriting and filling in research holes. A Difficult Boy was named an International Reading Association Notable Book for a Global Society, and a PEN New England Children’s Book Caucus Discovery Award winner. 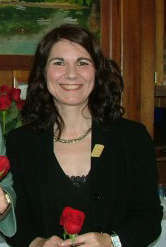 For more information about M.P., see her website: http://www.mpbarker.net or visit her blogs at mpbarker.livejournal.com OR mpbarker.blogspot.com.